In a recent issue of the journal Astronomy and Geophysics (A&G), Henrik Svensmark coined a new term: ‘cosmoclimatology’ . I think ‘cosmoclimatology’ is a good and refreshing name for anything combining our cosmos with our climate. However, all other aspects of the article I found very disappointing. We have already covered most of these topics before, but the A&G articles provides us with some new aspects to discuss. Furthermore, Svensmark is the Director for Center for Sun-Climate Research, Danish National Space Center, and therefore influential. He is also the co-author of a recent book with Nigel Calder that received some attention. Furthermore, a laboratory experiment of his also managed to make some headlines. It seems that solar forcing is one of the sceptics’ last trenches in the debate about climate change. In my view the A&G paper therefore merits a comment as long as the same old and worn arguments resurface without discussing misgivings from the critics. The chief objection to the idea that cosmic rays influence cloudiness came from meteorologists who insisted that there was no mechanism by which they could do so. On the other hand, some atmospheric physicists concluded that observation and theory had failed to account satisfactorily for the origin of aerosol particles without which water is unable is unable to condense to make clouds. I don’t think this is meant as a joke, and I don’t know if the article tries to make a point about classifying critics and supporters of his ideas as ‘meteorologists’ and ‘physicists’ (I’m a physicist). But that’s a tiny detail compared to the more substantial misconceptions embedded in this passage. There are plenty of ‘seeds’ in the air on which water can form, also known as cloud condensation nuclei (CCN). According to my old text book ‘A Short Course in Cloud Physics’ by Rogers and Yau (1989, p. 95 in Third edition): “Condensation nuclei of some sort are always present in the atmosphere in ample numbers: clouds form whenever there are vertical air motions and sufficient moisture”. The CCN tend to consist of mineral dust, sea salt, or sulphur-based matter. Attempts to show that certain details in the climatic record confirm the greenhouse forcing (e.g. Mitchell et al., 2001) have been less conclusive. By contrast, the hypothesis that changes in cloudiness obedient to cosmic rays help to force climate change predicts a distinctive signal that is in fact very easily observed, as an exception that proves the rule. Again, no further qualifications or references. The irony is that Svensmark ignores (in addition to the lack of trend in GCR) the fact that the night-time temperature has risen faster than the day-time temperature, which I did pester him about on a Nordic Meteorology Meeting in Copenhagen in 2002. A journalist from Jyllands Posten present at the conference got the message, as my criticism was echoed in a news report the following day (“Klimaforskere i åben krig” [translation ‘Climate researchers in open war’], May 28, 2002): It’s tricky to explain how a warming caused by decreasing albedo would be stronger at the night-side (dark) of the planet. Another newer puzzle is the surprisingly good correlation between low clouds and GCR (se figure below), since higher clouds (global mean cover ~13%) or middle clouds (~20%) which are not influenced by GCR, mask the lower ones (which represents between 28% and 30% of the globe). It’s indeed a surprisingly good fit between the two curves in the A&G article (reproduced below), considering the time structure of both the high-cloud, middle-cloud, and low-cloud curves, and the satellites cannot see the low-level clouds where there are higher clouds above blocking the view. The fact that the variations are small (~1% amplitude!) compared to the total area, suggest that the overlap/masking effect by the higher cloud must be very small for a high correlation to shine through the upper clouds. Even if the clouds hypothetically were completely determined by GCR, one would expect to see deterioration of the correlation if viewed from above due to the presence of higher clouds not influenced by GCR. Another issue is that the cloud data used in this analysis was only based on the infra-red (IR) channel, and a better analysis would include the visible observations too, but if the visible data are included, then the correlation is lower (private communications, Jørn Kristjansen). On a more technical note, there seems to be inconsistencies between the GCR presented in Fig 2 and 3 in the A&G article (see red circles in the plot above), and this is not explained in the article. In Fig. 3 (left panel above) the GCR count increases by 10% but the maximum value is about 0% in Fig. 2 (right panel above), and the minimum value is abut -18% in Fig 3 but only -13% in Fig 2. It seems as if Fig 2 & 3 were based on different data sources. To be fair, both GCR and ISCCP are continuously updated and revised. But I am surprised that routine update and revision would result in as large differences as seen here. It looks as if the curve has been readjusted at some stage, but it is then a bit strange that the curve representing the global lower cloud cover doesn’t seem to have been re-scaled: the difference between maximum and minimum is about 3% in both figures (it’s annoying that the vertical axis for the cloud cover are given in different units in Fig.2 & 3). Is this important? I don’t know. But it could be a sign of sloppy work. There is not sufficient information about methodology that I could repeat the results presented here. Svensmark must have adjusted the cloud data too. Shown below is a figure from a previous paper where he justified an adjustment from a break in the difference between low and high clouds. The question is: why would the error be in the lower cloud measurements and not the high clouds? I haven’t seen any other independent statements about breaks or problems in the data series for low clouds after ~1995. Apparently, there are some biases in the ISCCP data, and Stordal et al. (2005) suggest that there is a spurious “footprint” from METEOSAT imprinted on the high (cirrus) clouds, and the problems with the ISCCP trends are now becoming well known. Besides, the fundamental error Marsh and Svensmark made in their ‘correction’ has discussed before, but since this issue keeps re-appearing, the ‘adjustment’ is shown again (left) while the ‘adjustment’ cannot be discerned in independent plots of the most recent data (right, and a second opinion sought in an independent analysis by K. Gislefoss). A surprising by-product of this line of enquiry is a new perspective on changing fortunes of life over 3.5 billion years ago. Furthermore, the paper claims to explain the ‘faint sun paradox‘, by the complete absence of low clouds because there were allegedly no GCR at the time. Presumably, it is seriously meant. Proposing that the GCR is the only factor affecting low clouds, is inconsistent with the result shown in his very own Fig. 4 (the scatter plot shown left). 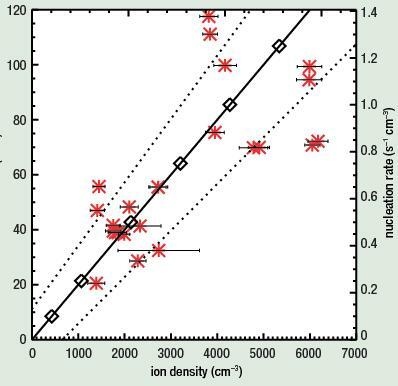 In the A&G article, Fig 4 doesn’t really show the relationship between GCR and clouds, but between ion density and numbers of ultra-small (radius greater than 3 nano-meters) aerosol nucleation. The large scatter suggests that the number of ultra-small aerosols is fairly weakly affected by the number of ions – otherwise all the points would lie close to the diagonal line. This implies that other factors must influence the formation of ultra-small aerosols in addition to some effect due to ionization. And this is only in the laboratory environment – on the outside of Svensmark’s test chamber, more factors may play a role. In the laboratory experiment ‘SKY’, UV-light was modulated to mimic the variations in the Sun, but it is not clear whether the effects observed due to changes in the UV are transferable to GCR. The experiment also involved natural GCR (as opposed to a particle beam which presumably would be easier to control), supplemented with gamma rays. Then the aerosols were according to the article stable ultra-small clusters of sulphuric acid. So, what about the larger aerosols which play a role in cloud formation? According to “Atmospheric particles and nuclei” by Götz et al. (1991), Junge (1963) proposed on the basis of aerosol measurements that ‘large’ and ‘giant’ particles (radius greater than 0.1 micro-meter) constitute the majority of CCN, independently of their chemical composition. Besides, the Köhler curve (also see here) based on theoretical work from 1926 and onwards indicates that droplets only start to grow spontaneously only the droplet is greater than a critical size (they are then ‘supercritical’). The number of sulphuric aerosols is also influenced by the availability of sulphur in general. The amount of sulphur can vary, e.g. with the combustion of fossil fuels, volcanic eruptions, as well as due to biological activity (i.e. through the emission of dimethyl sulphide, or ‘DMS’; Götz et al. ,1991, p. 108), and presumably the number of sulphuric acid clusters formed over the past billion years can have been affected by several of geological factors. Besides, it is the vapour pressure (or ‘supersaturation’) which really control whether cloud drops or not, seeing as aerosols tend to be around anyway. I also have some general questions regarding isotopic evidence from pre-historic times. Are isotopes from the distance past only created by GCR bombarding Earth’s atmosphere or could there be other sources? Could some be introduced by meteorite/astroid impacts, volcanic activity, or different emission of radon gas from Earth’s interior? I would expect the albedo effect presented by clouds to be weak over the mostly snow/ice covered Antarctica, but Svensmark argues that the clouds here warm rather than cool the temperature. This claim is not quantified. Is he suggesting some GHG-effect kicking in during the Antarctic winters? Is the sense/chronology of causation really determined? What about temperature affecting the cloudiness (e.g. advection of mild and moist air), and the role of circulation patterns? For sure, there is no simple one-way relationship. I think that the A&G article is bit too cavalier about the complexity involved in the atmospheric processes. The cavalier attitude seems to be a trademark of cosmoclimatology. I presume that many celestial bodies and complicated calculation of gravitational pull must make the modelling of the galaxy dynamics difficult, and star formation processes must have altered the distribution of mass and hence the gravitational field. So, surely the dynamics of the stars over billions of years can be characterised as chaotic? Is it really possible to re-construct the constellations and our solar systems trajectory around the galaxy more than 2 billion years ago with a precision which precedes that of calculating the effect of increasing the GHG concentrations at present day? Is the story as simple as the one narrated by Svensmark? He even suggests that his ideas amount to a paradigm shift, that ‘scientifically speaking’ is as secure as the prevailing paradigm of AGW. I find this sweeping statement a bit puzzling as no further qualification is made on the matter of AGW. Exactly what are the weak points in the AGW paradigm? I wonder if Svensmark really knows what he talks about. It is possible that GCRs do have an effect on climate through the modulation of clouds, but I don’t think it is very strong. I also think that Svensmark’s claims are wildly exaggerated, but most of my objection lies in the way the arguments have been presented in this A&G article. I have the impression that the A&G article comes from the same school as “The Skeptical Environmentalist“, which also has been criticised for cherry picking references to make mere speculation appear as more solidly founded. To ignore aspects that don’t fit the hypothesis is definitely not science. Neither is adjusting data so to provide a good fit without a solid and convincing justification. Science, however, means objectivity, transparency, repeatability, and in principle the possibility of falsification. Furthermore, it is only a lack of respect for the readers to publish an article that doesn’t provide all relevant sides to the story. I hope that Svensmark reads my comments and responds to them here at RealClimate. I also hope that this is read by scholars and journalists who start asking the critical questions. I do not know the answer to the questions that I pose here, so I’d be interested to hear your view. 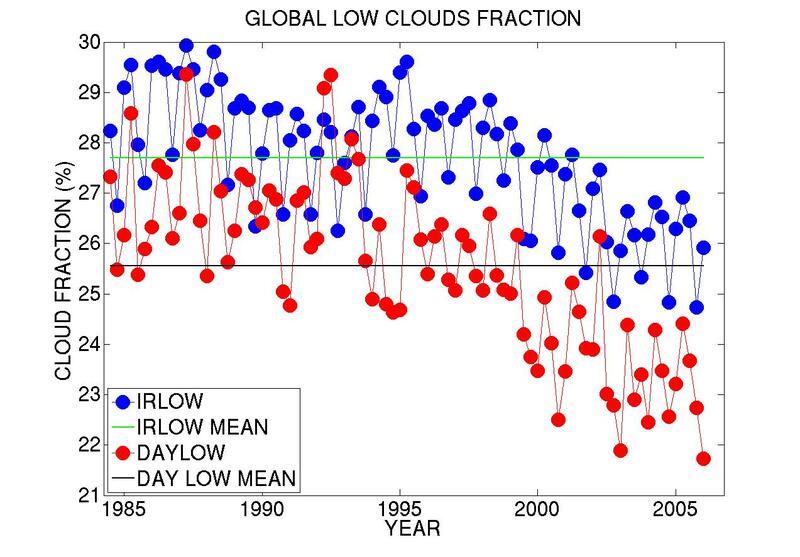 AcknowledgementsThanks to Jørn Kristiansen for comments and input to my post and Kristian Gislefoss for one figure on global low cloudiness.